The secret to overcoming objections with assistants is simple. Give me one second to explain. Are you ready to hear the answer? Ok, we're done. It's that easy! That's it! I do have a point here. And what might this point be? Go directly to the source (your sales prospect), cut out the middleman, and avoid speaking with them on your first contact all together. So if you bypass the assistant then this means no objections and that makes for an easier day of prospecting. There was a time in my cold call career when I thought that it was best to try to work with my prospect�s assistant, gatekeeper, screener or whatever you want to call them. But today, these tides have changed direction and I avoid them at all costs. Quite frankly, I really have no interest in speaking with them at all. Jill and John, sorry about the hang-up yesterday, of course, I�m just joking here. I don�t dislike them, their really nice people, but over the years, as I prospect for new business, I do everything in my capacity to avoid hearing them say, "What is this call Regarding?" or �(He or She) is not interested in that!� You know what, save that baloney for another cold caller because that�s not for me! From my experience, if I�m speaking with the assistant for the first time during my sales prospecting efforts, I find that they rarely relay the correct message to my prospect. And you know what? Who even knows if my message even reaches my prospect? Have you ever played that game when you were younger where you passed a verbal message around a circle and the message was the complete opposite of what the sender had sent? Now you know exactly what I mean! Bottom line is this, the number one job of an assistant is to weed out people like you and me! So why even waste your time with them in the first place? Listen, if I�ve already made contact with my prospect and then speak with the assistant then I�m fine with that. That part I�m ok with. And the only other time that I�m ok with speaking with assistant is when I�m looking for an email address. And in this case, I turn on my persuasive skills and ask nicely for my prospect�s email. Remember, you will always achieve the most success when you go directly to your source and of course, here I�m referring to your sales prospect. What techniques can you use to make this happen? The best way to avoid assistants and their sales objections is to make sure that you have the correct contact name of your prospect before you even pick up the telephone. You can easily find your prospect's name by visiting their website (see if you can find their direct extension or sometimes if the main company number is automated you can press # to get an employee directory), doing an internet search and finally, if it's a business owner (in most cases, your call should always be to the business owner) you can visit your State's Division of Corporation's website to do a free search for the owner. Another way to avoid the gatekeeper is by emailing your prospect directly and you can apply some of these previous techniques to this idea as well. If you can't find their email address then type the following in the internet search box: "email @thecompanyname.com" (no need to put the quotes around your search and there is a space between the word "email" and the "at" symbol). A list of employee emails may come up in the natural search and all you need to do is mimic their email address to the address of your sales prospect. These are just a few ways to avoid the middleman and in time, you will find your own way. Once you do, your sales will dramatically increase! Why you ask? Because the time you would normally take to overcome their objections will now be spent with your direct source---this being your sales prospect. and is known by sales professionals on virtually all seven continents! Mr. 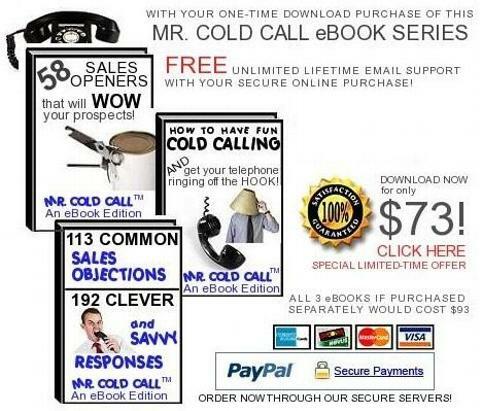 Cold Call� is a service of Mr. Cold Call, Inc.